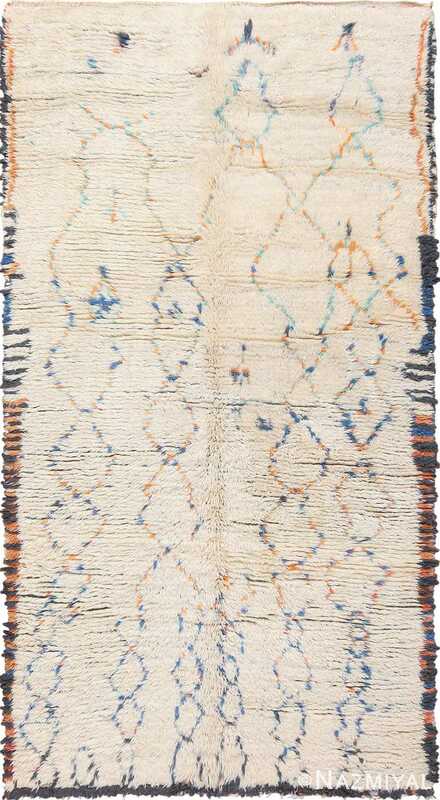 Riddled with energy, this tribal Moroccan rug features such a unique design that even repeated observations delight with surprises. Colorful and Primitive Vintage Moroccan Rug, Origin: Morocco, Circa: Mid-20th Century – Here is a fascinating and exciting vintage carpet – a mid-century Moroccan rug, characterized by an exceptionally vibrant palette and a unique, energetic tribal composition. Moroccan rugs and carpets – especially mid-twentieth century examples – are prized by designers and decorators for their cultural authenticity, and the is distinct aesthetics. While most mid-century Moroccan carpets – and almost all Beni Ourain carpets from this period – are characterized by an ivory field and sparse detail work, certain pieces espouse a more tribal aesthetic, with emphases on abstract expression and idiosyncratic, irregular arrangements of irregular shapes and figures. 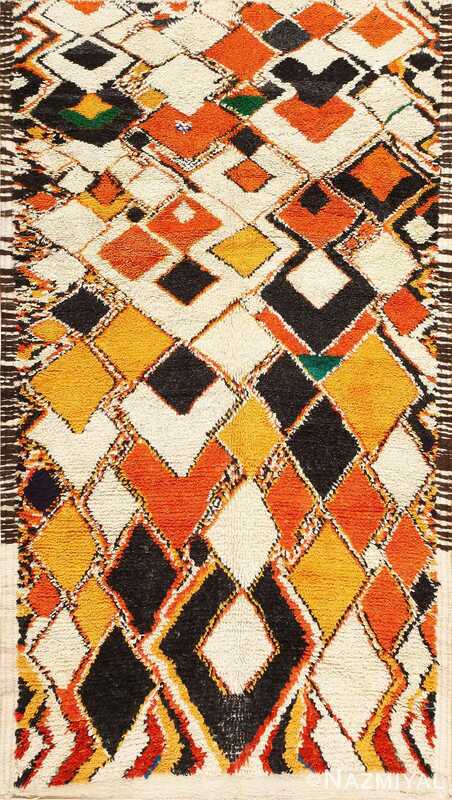 This particular rug naturally falls into this latter camp, as it boasts an extraordinary composition of overlapping, rectangular figures, rendered in vibrant shades of orange, yellow, green, and black. 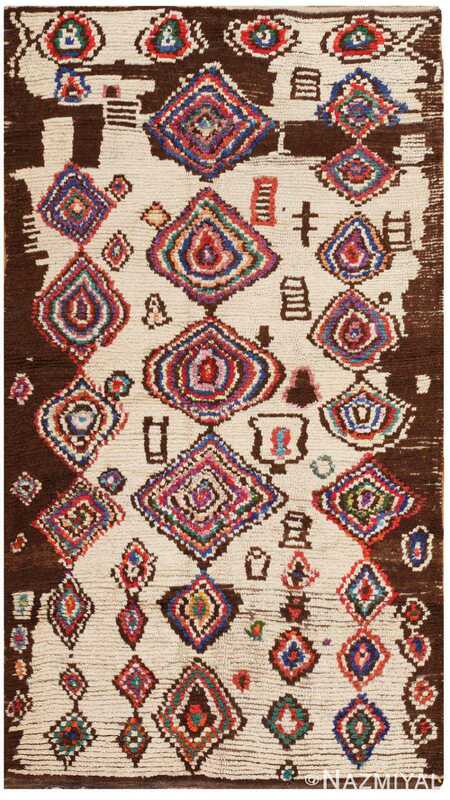 Riddled with energy, this tribal Moroccan rug features such a unique design that even repeated observations delight with surprises. 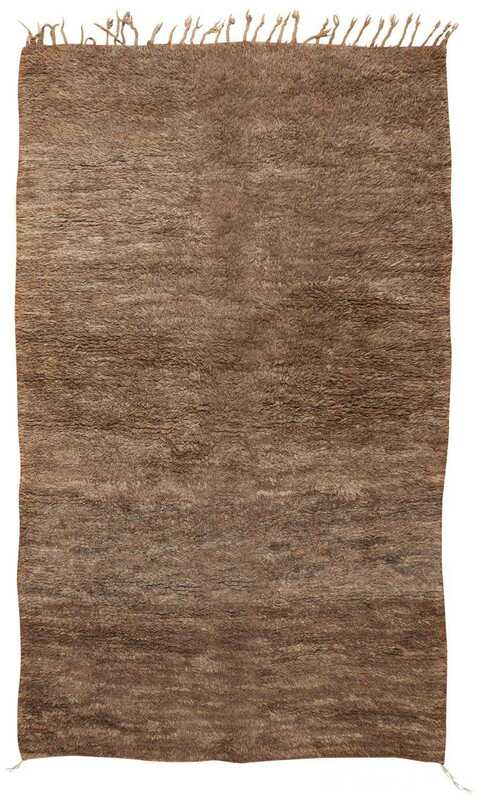 This understated Moroccan rug features a lush allover pattern with mottled details that emphasize the luxuriously textural pile of this timeless vintage rug.